Jordan (Arabic: الأردنّ ‎, transliterated as Al-Urdunn), officially the Hashemite Kingdom of Jordan (Arabic: المملكة الأردنية الهاشمية ), is an Arab country in the Middle East. It is bordered by Syria to the north, Iraq to the north-east, Saudi Arabia to the east and south, and Israel to the west. It shares with Israel the coastlines of the Dead Sea, and the Gulf of Aqaba with Israel, Saudi Arabia, and Egypt. With the break-up of the Ottoman Empire at the end of World War I, the League of Nations created French Mandate Syria and British Mandate Palestine. 80% of the British Mandate of Palestine was East of the Jordan river, or " Transjordan" (as opposed to " Cisjordan"). In 1921, the British gave semi-autonomous control of Transjordan to the Hashemite family, who had lost their civil war with the House of Saud for control of Mecca and Medina. The Hashemites continued to rule Transjordan until after World War II. In 1946, the British requested that the United Nations approve an end to British Mandate rule in Transjordan Palestine. Following this approval, the Parliament proclaimed King Abdullah the first ruler of the Hashemite Kingdom of Jordan. In 1950, Transjordan annexed the West Bank, which it kept under control after the armistice that followed the Arab League's war against Israel upon its declaration of independence in 1948. The annexation was recognised only by the United Kingdom. Following the formation of the United Arab Republic by Egypt and Syria, and the Iraqi Revolution in 1958, Jordanian trade routes and Iraqi oil supply were cut. Consequently, Jordan had to request aid from the United States and the United Kingdom, which prevented escalations between Jordan and the UAR (see Conflict between the United Arab Republic and Jordan). Jordan signed a mutual defense pact in May 1967 with Egypt, and it participated in the June 1967 war against Israel along with Syria, Egypt, and Iraq. During the war, Jordan lost the West Bank and East Jerusalem to Israel (the western sector having been under Israeli control). In 1988, Jordan renounced all claims to the West Bank but retained an administrative role pending a final settlement, and its 1994 treaty with Israel allowed for a continuing Jordanian role in Muslim and Christian holy places in Jerusalem. The United Nations considers the West Bank to be territory occupied by Israel and believes that its final status should be determined through direct negotiations among the parties concerned on the basis of UN Security Council Resolution 242 and UN Security Council Resolution 338. The 1967 war led to a dramatic increase in the number of Palestinians, especially from the West Bank, living in Jordan. Its Palestinian refugee population – 700,000 in 1966 – grew by another 300,000 from the West Bank. The period following the 1967 war saw an upsurge in the power and importance of Palestinian resistance elements (fedayeen) in Jordan. The heavily armed fedayeen constituted a growing threat to the sovereignty and security of the Hashemite state, and open fighting erupted in June 1970. The battle in which Palestinian fighters from various Palestinian Liberation Organization (PLO) groups were expelled from Jordan is commonly known as Black September. Other Arab governments attempted to work out a peaceful solution, but by September, continuing fedayeen actions in Jordan – including the destruction of three international airliners hijacked by the Popular Front for the Liberation of Palestine and held in the desert east of Amman – prompted the government to take action to regain control over its territory and population. In the ensuing heavy fighting, a Syrian tank force invaded northern Jordan to support the fedayeen but subsequently retreated. 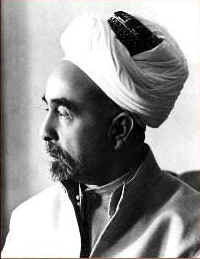 It is said by some people, such as Ahmad Jubreel, that King Hussein has asked the help from Israel, then Israel threatened that it will invade Jordan if Syria internvenes. By 22 September, Arab foreign ministers meeting at Cairo had arranged a cease-fire beginning the following day. Sporadic violence continued, however, until Jordanian forces led by Habis Al-Majali and with the help of the Iraqi forces (which had basis in Jordan after the war of 1967) won a decisive victory over the fedayeen in July 1971, expelling them from the country. At the Rabat summit conference in 1974, Jordan agreed, along with the rest of the Arab League, that the PLO was the "sole legitimate representative of the Palestinian people", thereby relinquishing to that organization its role as representative of the West Bank Palestinians. No fighting occurred along the 1967 Jordan River cease-fire line during the October 1973 Arab-Israeli war, but Jordan sent a brigade to Syria to fight Israeli units on Syrian territory. Jordan did not participate in the Gulf War of 1990-91. In 1991, Jordan agreed, along with Syria, Lebanon, and Palestinian fedayeen representatives, to participate in direct peace negotiations with Israel at the Madrid Conference, sponsored by the U.S. and Russia. It negotiated an end to hostilities with Israel and signed a declaration to that effect on July 25, 1994 (see Washington Declaration). As a result, an Israeli-Jordanian peace treaty was concluded on October 26, 1994. 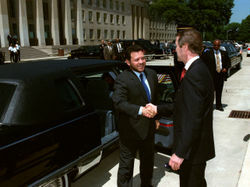 Following the outbreak of Israel-Palestinian Authority fighting in September 2000, the Jordanian government offered its good offices to both parties. Jordan has since sought to remain at peace with all of its neighbors. On November 9, 2005, Jordan experienced three simultaneous bombings at hotels in Amman. At least 57 people died and 115 were wounded. " Al-Qaeda in Iraq", a group led by terrorist Abu Musab al-Zarqawi, a native Jordanian, claimed responsibility. On September 4, 2006, a 38-year-old deranged zealot, and a known criminal, took a pistol to a Roman amphitheatre in the capital of Amman and proceeded to shoot at a group of Western tourists. One British man was killed and five others tourists wounded, including a Jordanian tourist security guard. The constitution provides for three categories of courts: civil, religious, and special. Administratively, Jordan is divided into twelve governorates, each headed by a governor appointed by the king. They are the sole authorities for all government departments and development projects in their respective areas. The Royal Armed Forces and General Intelligence Department of Jordan are under the control of the king. Jordan's legal system is based on Islamic law and French codes. Judicial review of legislative acts occurs in a special High Tribunal. It has not accepted compulsory International Court of Justice jurisdiction. Legislative power rests in the bicameral National Assembly. The 110-member Chamber of Deputies, elected by universal suffrage ("one man, one vote"), to a four-year term, is subject to dissolution by the king. Nine seats are reserved for Christians, six for women, and three for Circassians and Chechens. The forty-member Senate is appointed by the king for a four-year term. King Abdullah I ruled Jordan after independence from Britain. After the assassination of King Abdullah I in 1951, his son King Talal ruled briefly. King Talal's major accomplishment was the Jordanian constitution. King Talal was removed from the throne in 1952 due to mental illness. At that time his son, Hussein, was too young to rule, and hence a committee ruled over Jordan. After Hussein reached 18, he ruled Jordan as king from 1953 to 1999, surviving a number of challenges to his rule, drawing on the loyalty of his military, and serving as a symbol of unity and stability for both the Bedouin-related and Palestinian communities in Jordan. King Hussein ended martial law in 1991 and legalized political parties in 1992. In 1989 and 1993, Jordan held free and fair parliamentary elections. Controversial changes in the election law led Islamist parties to boycott the 1997 elections. 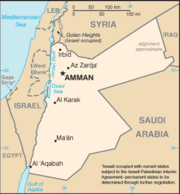 Jordan is a Middle Eastern country, bordered by Syria to the north, Iraq to the northeast, Saudi Arabia to the east and south and both Israel and the West Bank to the west. All these border lines add up to 1,619 kilometers (1,006 mi). The Gulf of Aqaba and the Dead Sea also touch the country, and thus Jordan has a coastline of 26 kilometers (16 mi). Jordan consists mostly of arid desert plateau in the east, with Highland area in the west. The Great Rift Valley of the Jordan River separates Jordan and Israel. The highest point in the country is Jabal Ram (1,734 m; 5,689 ft), while the lowest is the Dead Sea (-486 m; -1,594 ft). Jordan is part of a region considered to be "the cradle of civilization". Major cities include the capital Amman in the northwest, Irbid and Az Zarqa, both in the north. The climate in Jordan is dry and hot, since the country is mainly desert. However, the western part of the country receives greater precipitation during the rainy season from November to April. Jordan is a small country with limited natural resources. The country is currently exploring ways to expand its limited water supply and use its existing water resources more efficiently, including through regional cooperation. Jordan also depends on external sources for the majority of its energy requirements. During the 1990s, its crude petroleum needs were met through imports from Iraq and neighboring countries. Since early 2003, oil has been provided by some Gulf Cooperation Council member countries. In addition, the Arab Gas Pipeline from Egypt to the southern port city of Aqaba was completed in 2003. The government plans to extend this pipeline north to the Amman area and beyond. Since 2000, exports of light manufactured products, principally textiles and garments manufactured in the Qualifying Industrial Zones (QIZ) that enter the United States tariff and quota free, have been driving economic growth. Jordan exported €5.6 million ($6.9 million) in goods to the U.S. in 1997, when two-way trade was €321 million ($395 million); it exported €538 million ($661 million) in 2002 with two-way trade at €855 million ($1.05 billion). Similar growth in exports to the United States under the bilateral US-Jordan Free Trade Agreement that went into effect in December 2001, to the European Union under the bilateral Association Agreement, and to countries in the region, holds considerable promise for diversifying Jordan's economy away from its traditional reliance on exports of phosphates and potash, overseas remittances, and foreign aid. The government has emphasized the information technology (IT) and tourism sectors as other promising growth sectors. The low tax and low regulation Aqaba Special Economic Zone ( ASEZ) is considered a model of a government-provided framework for private sector-led economic growth. The Free Trade Agreement (FTA) with the United States that went into effect in December 2001 will phase out duties on nearly all goods and services by 2010. The agreement also provides for more open markets in communications, construction, finance, health, transportation, and services, as well as strict application of international standards for the protection of intellectual property. In 1996, Jordan and the United States signed a civil aviation agreement that provides for "open skies" between the two countries, and a U.S.-Jordan treaty for the protection and encouragement of bilateral investment entered into force in 2003. Jordan has been a member of the World Trade Organization since 2000. Textile and clothing exports from Jordan to the United States shot up 2,000 percent from 2000 to 2005, following introduction of the FTA. According to the National Labor Committee, a U.S.-based NGO, Jordan has experienced sharp increases in sweatshop conditions in its export-oriented manufacturing sector. Jordan is classified by the World Bank as a "lower middle income country." The per-capita GDP was approximately $1,817 (€1,479) for 2003 and 14.5% of the economically active population, on average, was unemployed in 2003. The GDP per capita in 2005 is at $USD 4,200. Education and literacy rates and measures of social well-being are relatively high compared to other countries with similar incomes. Jordan's population growth rate is high, but has declined in recent years, to approximately 2.8% currently. One of the most important factors in the government’s efforts to improve the well-being of its citizens is the macroeconomic stability that has been achieved since the 1990s. However, unemployment rates remain high, with the official figure standing at 12.5%, and the unofficial around 30%. Rates of price inflation are low, at 2.3% in 2003, and the currency has been stable with an exchange rate fixed to the U.S. dollar since 1995. While pursuing economic reform and increased trade, Jordan's economy will continue to be vulnerable to external shocks and regional unrest. Without calm in the region, economic growth seems destined to stay below potential. On the positive side, however, there is huge potential in the solar energy falling on Jordan's deserts, not only for the generation of pollution-free electricity but also for such spin-offs as desalination of sea water (see Trans-Mediterranean Renewable Energy Cooperation (TREC)). 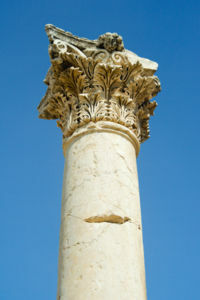 The Corinthium column is a popular tourist attraction in Jerash. Petra in Ma'an, the home of Nabateans, is a complete city carved in a mountain. The rocks are colorful, mostly pink, and the entrance to the ancient city is a long, narrow, crack in the mountain - called the Siq. 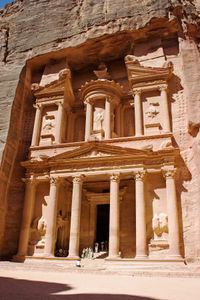 In the city are various structures, all (except 2) are carved in rock, including the treasury, which is now nominated by the New Seven Wonders organisation to be one of the New Seven Wonders of the World. Umm Qais, a town located on the site of the ruined Hellenistic-Roman city of Gadara. 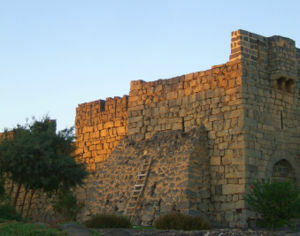 Ajlun, famous for the Islamic al- Rabadh Castle. Jerash, famous for its its ancient Roman architecture, like columns and arches. 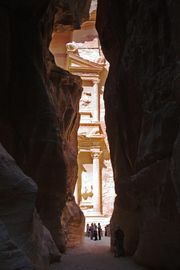 The treasury, as seen from al-Siq. Amman contains the Roman theatre, in addition to several museums. Al Karak contains an important castle from the times of Salah al-Din, known as Al-Karak Castle. The River Jordan, which is the river where Jesus Christ was baptised, by John the Baptist. The Dead Sea, for the unusual floating and natural salts that occur excessively. It is the lowest point on earth, 402 meters below sea level, and becomes 1 meter lower each year . It is located near River Jordan. Aqaba is a town on the shore of the Gulf of Aqaba with numerous shopping centers, hotels and access to water sports. Wadi Rum is a desert full of mountains and hills located south of Jordan. It is popular for its wonderful sights in addition to a variety of sports that are practiced there, such as rock-climbing. Amman is a very modern city with lots of malls, shopping centers, hotels and an ancient Roman amphitheatre etc. Mahis with Important religious sites, and wonderful landscape . The ongoing Arab-Israeli conflict, the Gulf War, and other conflicts in the Middle East have made huge impacts on the economy of Jordan. The fact that Jordan has peace with the surrounding countries, combined with its stability, has made it a preference for many Palestinians, Lebanese, and people from the Persian Gulf immigrants and refugees. Though this may have resulted in a more active economy, it has also damaged it by substantially decreasing the amount of resources each person is entitled to. Jordan has a law that states that any Palestinian may immigrate and obtain Jordanian citizenship 'unless he is a Jew'. This law is not always enforced vis a vis the permiting of entrance to Palestinians. It is also illegal for a Jew to purchase land in the Kingdom. This violence has also led to a rise of extremism in Jordan. 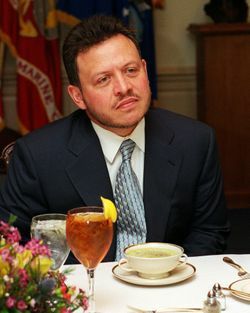 In November 2005, King Abdullah called for a "war on extremism" in the wake of three suicide bombings in Amman. Jordan has consistently followed a pro-Western foreign policy and traditionally has had close relations with the United States and the United Kingdom. These relations were damaged by Jordan's neutrality and maintaining relations with Iraq during the first Gulf War. It has a well earned reputation for usually following a pragmatic and non-confrontational foreign policy, leading to fair relations with its neighbors. Following the Gulf war, Jordan largely restored its relations with Western countries through its participation in the Middle East peace process and enforcement of UN sanctions against Iraq. Relations between Jordan and the Gulf countries improved substantially after King Hussein's death. Following the fall of the Iraqi regime, Jordan has played a pivotal role in supporting the restoration of stability and security to Iraq. The Government of Jordan signed a memorandum of understanding with the Coalition Provisional Authority in Iraq to facilitate the training of up to 30,000 Iraqi police cadets at a Jordanian facility. Jordan signed a nonbelligerency agreement with Israel (the Washington Declaration) in Washington, DC, on 25 July 1994. King Hussein and Yitzhak Rabin negotiated this treaty. Jordan and Israel signed a historic peace treaty on 26 October 1994, witnessed by President Bill Clinton, accompanied by US Secretary, Warren Christopher. The U.S. has participated with Jordan and Israel in trilateral development discussions in which key issues have been water-sharing and security; cooperation on Jordan Rift Valley development; infrastructure projects; and trade, finance, and banking issues. Jordan also participates in the multilateral peace talks. Jordan belongs to the UN and several of its specialized and related agencies, including the World Trade Organization (WTO), the International Meteorological Organization (IMO), Food and Agriculture Organization (FAO), International Atomic Energy Agency (IAEA), and World Health Organization (WHO). Jordan also is a member of the World Bank, International Monetary Fund (IMF), Organization of the Islamic Conference (OIC), Nonaligned Movement (NAM), and Arab League. Since the outbreak of the Al-Aqsa Intifada in September 2000, Jordan has worked hard, in a variety of forums, to maintain lines of communication between the Israelis and the Palestinians to counsel moderation and to return the parties to negotiations of outstanding permanent status issues. Following the Al-Aqsa Intifada, though, Jordan along with Egypt withdrew its ambassadors from Israel. 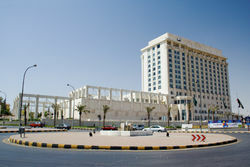 Following the Sharm-al-Sheik Summit in Egypt on 8 February 2005, both countries announced plans to return ambassadors to the country. 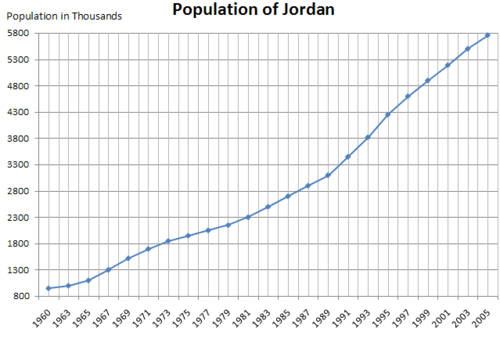 Jordan has a population of 5.8 million. Most of the Jordanian population descend from bedouin or tribal origins and account for around 40% of the population. However, 55% of Jordan’s population are from Palestinian origins who fled Palestine or came as refuges to Jordan and gained citizenship after the Arab Israeli war in the year 1948 and 1967. The remaining 5% of the population come from different ethnic minorities such as Circassians, Chechens, Armenians and Kurds, some of whom have needed to adapt to Arab culture. The number of Lebanese permanently settling in Jordan since the 2006 Israel-Lebanon conflict has not been established, and is estimated to be very little. Christians form approximately 6% of the population and they have 9% of the seats in parliament. Most Christians belong to the Greek Orthodox church (called “Room Urthudux” in Arabic). The rest are Roman Catholics (called “Lateen”), Eastern Catholics (called “Room Katoleek” to distinguish them from "Western Catholics”), and various Protestant communities including Baptists. Christians in Jordan are of many nationalities, as evinced, for example, by the Catholic mass being celebrated in Arabic, English, French, Italian, Spanish, Tagalog and Sinhala, as well as in Iraqi dialects of Arabic. Since the Iraq War, many Christians from Iraq have settled permanently or temporarily in Jordan. The official language is Arabic, but English is used widely in commerce and government and among educated people. Arabic and English are obligatorily taught at public and private schools. French is taught at some public schools but is not obligatory. About 3 million people registered as Palestinian refugees and displaced persons reside in Jordan, most as citizens. Since 2003 many Iraqis fleeing the Iraq War have settled in Jordan; they have not yet been counted. Jordan has given great attention to education in particular. Its educational system is of international standards and its secondary education program is accepted in world-class universities. Basic education, which includes 10 years of school study. It is a requirement for all Jordanian citizens. Secondary education, which can either be academic or vocational. At the end of the two-year period, students sit for the general secondary examination ( Tawjihi) in the appropriate branch and those who pass are awarded the Tawjihi (General Secondary Education Certificate). The academic stream qualifies students for entrance to universities, whereas the vocational or technical type qualifies for entrance to Community colleges or universities or the job market, provided they pass the two additional subjects. Vocational secondary education, which provides intensive vocational training and apprenticeship, and leads to the award of a Certificate (not the Tawjihi). This type of education is provided by the Vocational Training Corporation, under the control of the Ministry of Labour / Technical and Vocational Education and Training Higher Council. Private schools in Jordan also used to offer GCSE examinations, but they have now been replaced by IGCSE examinations. Upon graduation, the ministry of Higher Education, through a system similar to that of the UK tariff points, transforms the Grades/Marks of these foreign educational programs, into the same marks used in grading Tawjihi students. This system is controversial, both as to the conversion process and the number of places allocated to non-Tawjihi applicants. Another source of trouble is the system used to transform exam results of foreign education programs into the Tawjihi scale, which is a percentage out of 100. Again, some see the system as fair and in fact over lenient with non-Tawjihi graduates, while others see it as unfair. Access to higher education is open to holders of the General Secondary Education Certificate who can then choose between private Community Colleges, public Community Colleges or universities (public and private). The credit-hour system, which entitles students to select courses according to a study plan, is implemented at universities. At present, there are eight public universities plus two newly- licensed ones, and thirteen private universities plus four newly- licensed ones. All post-secondary education is the responsibility of the Ministry of Higher Education and Scientific Research. The Ministry includes the Higher Education Council and the Accreditation Council. Non-university level post-secondary studies (technical/vocational type): Non-university and vocational studies are offered in community colleges, access to which is open to holders of all types of general secondary education certificates. The two-to three-year programme encompasses many fields, such as Arts, Science, Management, Business Administration and Engineering. As of 1997, all public Community Colleges are under the supervision of Al-Balqa Applied University. At the end of the two- or three-year course, students sit for a comprehensive examination (Al-Shamel). Those who pass are awarded the Associate Degree / Diploma. The universities in Jordan follow the English-American education systems and associated with many American and English universities. Bachelor's Degrees normally take four years. In Dentistry, Pharmacy and Engineering, studies last for five years. In Medicine, they last for six years, followed by an Internship which lasts for one year. The Bachelor's Degree requires a total of 126-164 credit hours, depending on the field of study. Master's degree is awarded after a further 1-2 years' study following upon the Bachelor's Degree. It can be obtained either by course work and a thesis (c. 24 credit hours of courses and nine credit hours of research), or by course work (c. 33 credit hours) and a comprehensive examination. Candidates should hold the Bachelor's Degree with "good" as a minimum rating. A Doctorate Degree is awarded after three to five years of further study and the submission of an original dissertation. It requires, depending on the subject, 24 credit hours of course work and 24 credit hours of research. Candidates should hold a Master's Degree with "very good" as a minimum rating. Basic school teachers must hold a Bachelor's Degree. Secondary school teachers must hold a Bachelor's Degree and a one-year postgraduate Higher Diploma in Education. They must hold a Doctorate (PhD). In some cases a Master's Degree is sufficient. This type of education is offered at the newly-established branch of the Arab Open University. Lifelong education is offered at public and private universities, public and private community colleges, the Jordan Institute of Public Administration, The Jordan Geographic Centre and The Royal Scientific Society, as well as in other institutions. Courses are offered in Engineering, Industry, Agriculture, Foreign Languages, Computer Sciences, Managerial Sciences, Secretarial Studies, Physical Education and subjects that can help the local community. Courses last between one week and six months at the end of which students obtain a Certificate of Attendance or Achievement. The qualifications needed depend on the subject and level of the course. Some are designed for specific occupations, in which case a work experience in the relevant field is needed to attend such courses.